I don't know about you, but when I was planning my wedding I had such a hard time coming up with a wedding favor to give my guests! What is something cute and fun that people will actually want? Luckily, we're here to help you out! We've partnered with many brides and grooms to jazz up their favors and wanted to share with you a few of the best ideas we've come across. Hard to go wrong with mini-champagne bottles, especially when they're glitter-tastic! Check out this DIY tutorial from Pottery Barn to get started. Cheers! Love IS sweet, isn't it?! Jars of honey are an adorable, classic favor idea. Chocolate is one of the most popular sweet treats, so why not give some to your guests? Especially these amazing ones from local company Fran's Chocolates. For those that aren't chocolate lovers, Sugarfina Candies are some of my favorite plus they come in these elegant boxes that will look great on your table setting. Pro Tip: Clean out the box and use it to store knick knacks on your desk! Put together small flower arrangements for your guests to take home. Stop by IKEA and pick up some very affordable bud vases to use, and save money on buying them from your florist. Getting married in Seattle? Since we're known for coffee, consider packaging up some local beans in a fun, custom box. 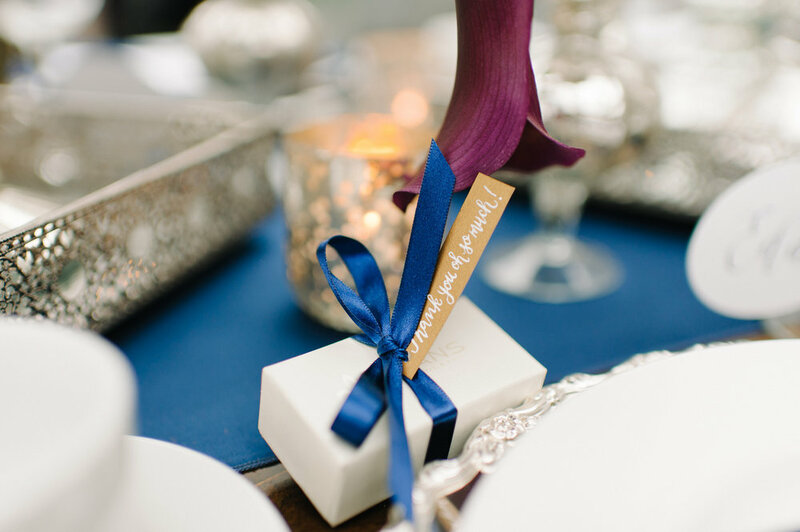 Decorate a fragrant bar of soap with a cute tag and your wedding monogram. Who doesn't love cookies?! I'll tell you - no one! A brilliant idea for your guests to keep in their purse, and inevitable use at the hotel after-party!